Biotinylated Mouse CD32b, His Tag, Avi Tag (SPR verified) (CDB-M82E8) is expressed from human 293 cells (HEK293). It contains AA Thr 40 - Arg 217 (Accession # NP_001070657.1). The protein has a calculated MW of 24.0 kDa. The protein migrates as 38-45 kDa under reducing (R) condition (SDS-PAGE) due to glycosylation. 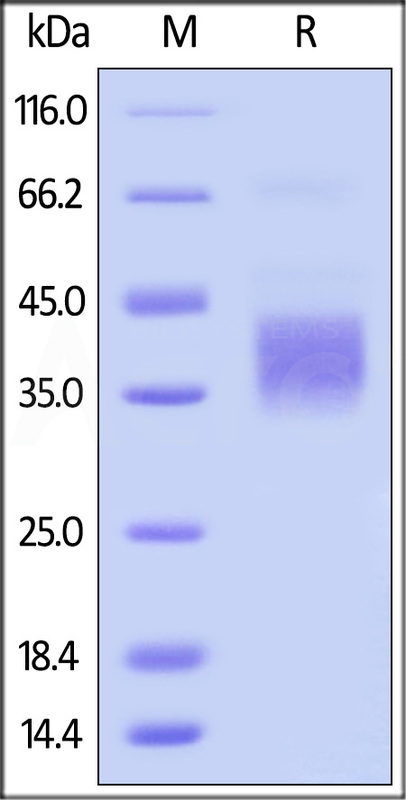 Biotinylated Mouse CD32b, His Tag, Avi Tag (SPR verified) on SDS-PAGE under reducing (R) condition. The gel was stained overnight with Coomassie Blue. The purity of the protein is greater than 95%. Biotinylated Mouse CD32b, His Tag, Avi Tag (SPR verified) (Cat. No. CDB-M82E8) captured on Biotin CAP- Series S Sensor Chip can bind OKT3 with an affinity constant of 1.53 μM as determined in a SPR assay (Biacore T200) (QC tested). Receptors for the Fc region of IgG (Fc γ R) are members of the Ig superfamily that function in the activation or inhibition of immune responses. Three classes of human Fc γ Rs: RI (CD64), RII (CD32), and RIII (CD16), which generate multiple isoforms, are recognized. There are three genes for human Fcγ RII /CD32 (A, B, and C) and one for mouse Fcγ RII B (CD32B). CD32 is a low affinity receptor for IgG. Low affinity immunoglobulin gamma Fc region receptor II-b (FCGR2B) is also known as CD32b, FCG2, IGFR2. CD32B is expressed on B cells and myeloid dendritic cells. Ligation of CD32B on B cells downregulates antibody production and may, in some circumstances, promote apoptosis. Co-ligation of CD32B on dendritic cells inhibits maturation and blocks cell activation. CD32B may also be a target for monoclonal antibody therapy for malignancies. (1) Hamada F., et al., 1993, Proc. Natl. Acad. Sci. U.S.A. 90:6305-6309. (2) Sarmay G., et al., 1997, Immunol. Lett. 57:159-164. (3) Laine D., et al., 2005, J. Gen. Virol. 86:1771-1784.